"From the fury of the Northmen deliver us, O Lord." was a medieval prayer said in hopes to offer protection from Viking radiers Big, tough, fast and scary. And that's only the Viking children! You can bet that Viking swords were just as strong as the men who used them. The Vikings had every advantage that one could think of in combat. Their ships were some of the fastest on the oceans. Their swords were some of the finest in the world, and their culture provided the perfect background for fine warriors. It's no wonder that they conquered so much of the known world (and that so many American football teams are names after them). The Vikings were fierce fighters and could survive against very strong opposition, as they proved time and again throughout history. But with their fast longships, the Vikings didn't have to face strong opposition. They could reach coastal villages and get out again long before the villagers had time to call for assistance from surrounding lands. This was the ideal method for Vikings: strike quickly, take what you could, then leave again before organized resistance could form. It was only when the Vikings started making permanent outposts in England that they were defeated, and it wasn't through military defeats either. The Vikings, settled and defensible, no longer were raiders and conquerors, they became a part of England, assimilated into the population. To wax poetic for a moment, the Vikings were assimilated into the country as a sunken ship is assimilated by coral in a coral reef, becoming itself an important part of the reef. All right, so it ain't Shakespeare; The Vikings weren't into the whole flowery poet stuff anyway (you ever read Beowulf? Not exactly Lord Byron type stuff). 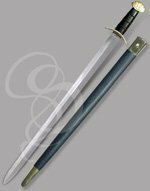 Swords from the Viking lands (including Northern Germany) have a long and distinguished history through the middle ages, and still have some prescience there today. The city of Solingen was the Toledo or Damascus of Northern Europe; swords that came from Solingen, particularly from the family of swordmakers known as Ulfberht, were revered, and many counterfeit sword makers stamped the word "Ulfberht" on their blades to give them more value (often misspelling the name). 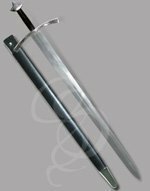 In fact, the early Viking swords are often said to have been the predecessors to the knightly broadswords/arming swords of the middle ages. 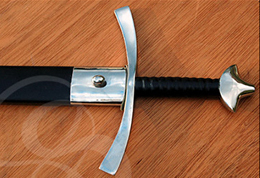 Many Viking blades have similar features, which makes them fairly easily to identify: A distinctive three-lobed "wave" pommel, long straight double-edges, wide fuller (groove that runs down the blade), and a short grip. 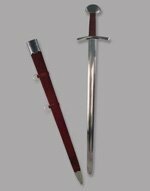 Viking swords usually were a little shorter than the arming swords carried by knights later on in history (possibly because the Vikings were always on the move and often raided from ships; it's difficult to make lightning fast raids with large, cumbersome swords). 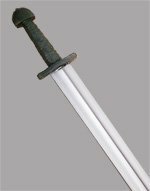 Like knightly swords, though, Viking swords often bore engravings upon the blades, usually featuring important or sacred phrases and pictographs.